Most people don’t spend a lot of time thinking about their pools in the cold winter months – and who can blame them? Maryland winters get pretty cold and snowy, especially in January and February. However, it’s important to keep your pool in good shape throughout the winter so that when you open your pool again in the spring, there aren’t any major problems. You might be wondering how you could possibly be taking care of your pool when the cover is on it. We’ve got a few suggestions for you! Keep your pool cover clean – It’s important to keep all debris off of your pool cover to avoid it caving in. On that note, it is of absolute importance to keep a cover on your pool for the entirety of the winter. Not only will it help keep the temperature of your pool even, but it will also keep out wildlife as well as children. Make sure to hose off the cover if it’s warm enough and use a push broom to remove debris otherwise. Add chlorine as soon as the water thaws – The first thing you’ll want to do is make sure that your pool is clean when spring hits. This is a job for the chlorine and your filter. Even before you entirely open your pool, you’ll want to add a gallon or two of chlorine to the water that’s left in order to ensure that your pool is clean and clear when you are ready to open. We also recommend a healthy dose of algaecide. Open your pool early in the spring – We’re generally finished with all of the cold weather by mid-March to early April. 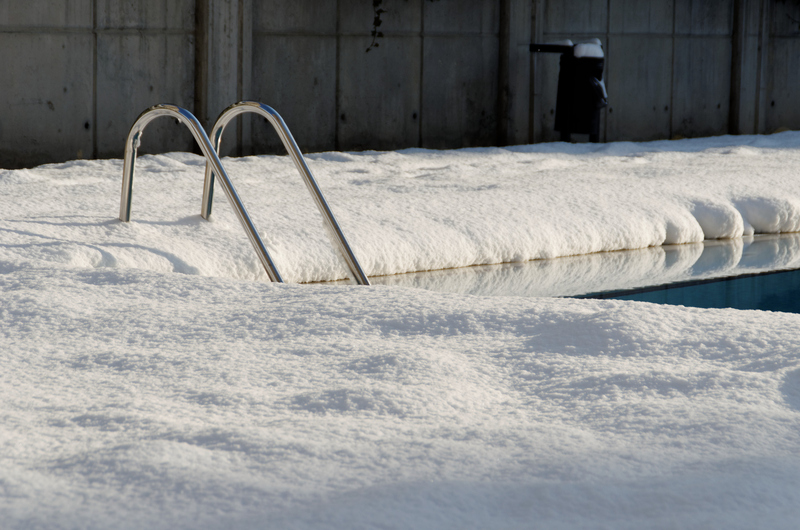 Once the freezing weather is out of winter’s system, you should get started on opening your pool. Letting the water get too warm can encourage more bacteria to grow, which can make it much harder to clean your pool post-opening. Call Sunrise Premiere Pool Builders today! In addition to quality pool and spa construction, Sunrise Premiere Pool Builders offers affordable, fast, and thorough pool maintenance and repair for any problem your Maryland pool or spa could face. Our friendly pool repair experts will get the job done quickly and at a price you can afford. Sunrise Premiere Pool Builders also provides supplies of automatic cleaners, automatic covers & mesh covers, pumps & filters, chemicals, special lighting systems, salt generating systems, heaters, and pool toys. We will transform your pool environment into a private oasis. If you have any questions about pool renovations or need installments, contact Sunrise Premiere Pool Builders through our website, by calling 410-349-3852, or simply clicking here today! Check us out on Facebook, Twitter, LinkedIn, Pinterest, and Google+ as well! This entry was posted on Monday, January 26th, 2015 at 3:36 pm. Both comments and pings are currently closed.